Christine Ennew is Provost at the University of Warwick where she supports the Vice Chancellor in the academic leadership of the University. A key aspect of her role is leading the development and delivery of the University’s academic strategy, ensuring that Warwick remains competitive and relevant within HE and beyond. She is responsible for the efficient and effective use of academic resources (including departmental resources, capital planning and space management, and information resources). Christine graduated from Cambridge University and completed her PhD at Nottingham. 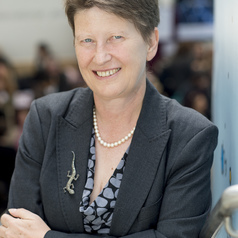 She began her academic career as an agricultural economist at the University of Newcastle-upon-Tyne in 1985. She then moved to the University of Nottingham and in 1995 was promoted to Professor of Marketing. She also held visiting academic appointments at Lehigh University in Pennsylvania and the Indian Institute of Management in Calcutta. She has served as Deputy Director of Nottingham University Business School and Academic Director of the Business School at the University’s Malaysia Campus during its start-up phase (2000-01). From 2004-07 she was Dean of Social Sciences and from 2008-2016 she was one of Nottingham’s Pro Vice Chancellors, as well as serving as Provost and CEO of the University of Nottingham Malaysia Campus. She joined the University of Warwick in August 2016. She has been actively involved in research in the financial services sector for most of her academic career. She has focused her research on key strategic themes, including service quality and delivery, loyalty and retention, and service failure and recovery and has completed a range of funded projects, most notably in relation to the development of the Trust Index. She has also undertaken business oriented research specifically in the areas of customer satisfaction, marketing relationships and trust, including on behalf of a number of major banking organisations. In addition to her work on financial services, she is increasingly involved in writing and speaking about the management and marketing of higher education with a particular emphasis on the nature, growth and development of international higher education.